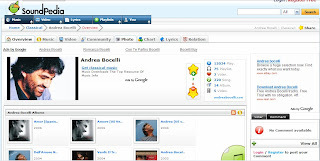 Soundpedia is an online music site, that lets people find old or new music, play and listen them. You can make your own playlist if you like, browser other people's playlists to find something new. It is a social community, you can post your comments, chat with your friends. You can search or browser genres to find artists or song which you like, if you want listen a song just click, it pop up a new window with a player, you can play this song and some songs with lyric. If you like MTV, maybe you will enjoy that either there. Soundpedia looks nice and with some good features.